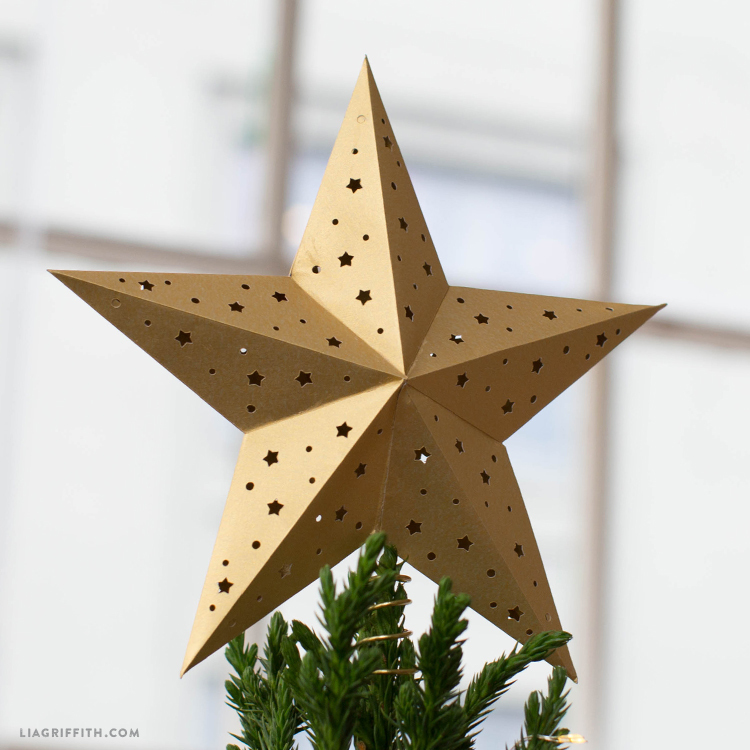 Make a statement with our 3D paper star tree topper this holiday season. 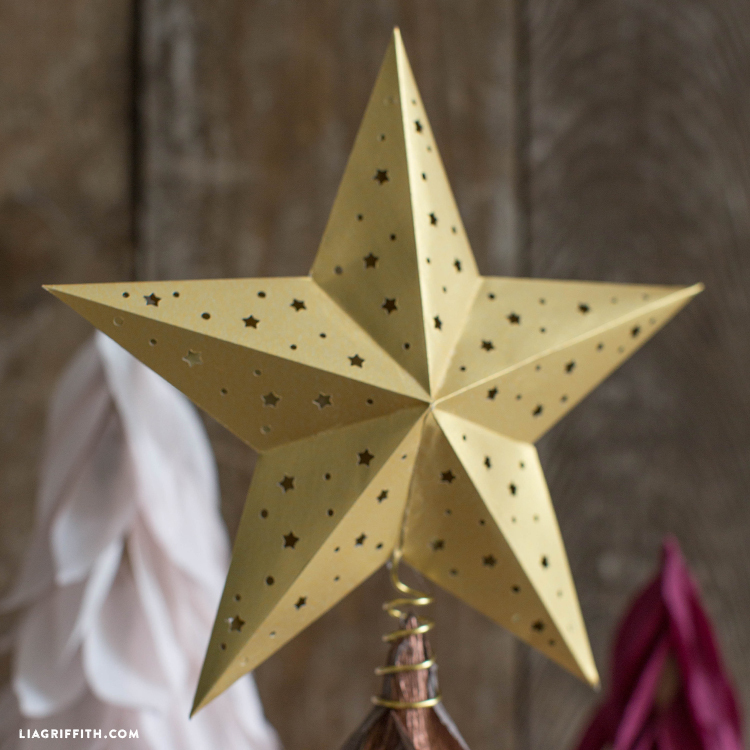 Using a heavy card stock, save your star to use for Christmases to come. With the help of a cutting machine, this project is surprisingly simple and quick to create. If you don’t have access to a cutting machine, have no fear! 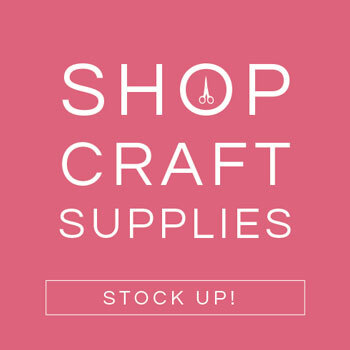 An X-Acto blade and hole punches will create just as pretty of an effect. This paper tree topper will be the star of your holiday show. 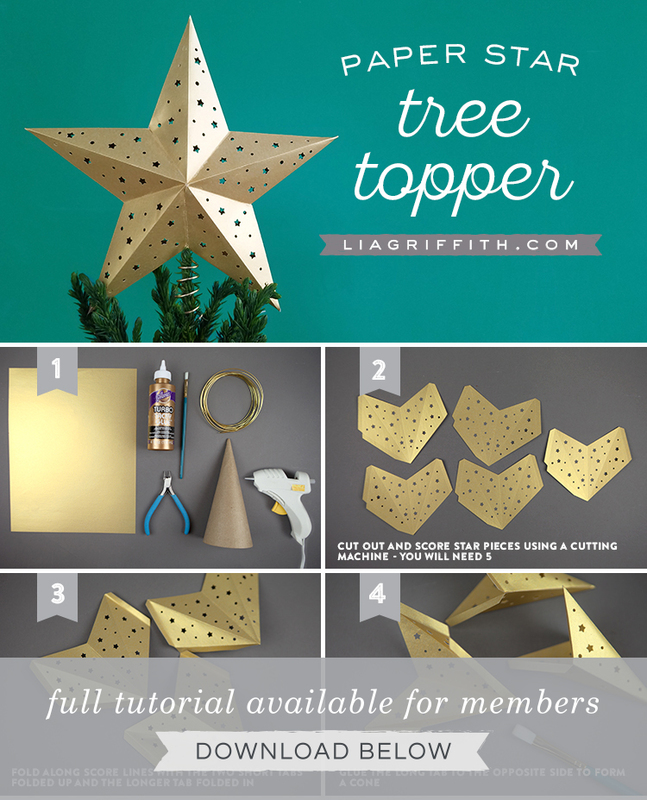 Cut out and score your star pieces using a cutting machine (recommended). If not, print the template directly onto paper and cut out with an X-Acto blade and score along dotted lines with a bone folder. You can use punches for the cut outs. You will need five pieces to make a star. Fold along the score lines. 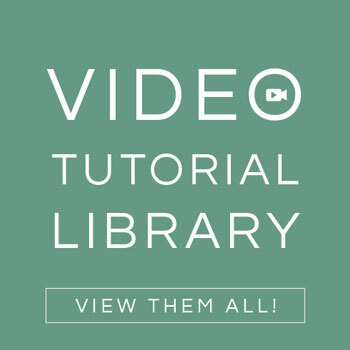 The two shorter tabs should be folded up and the longer tab folded inward, as shown in the photo tutorial. Glue the long tab to the opposite side using tacky glue and a flat paintbrush to make a cone shape. Full tutorial available for members. 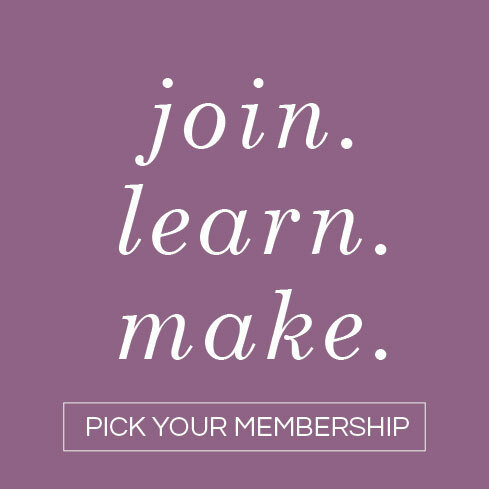 Join here. You must have read my mind!!! Mikey’s star topper from when he was a kid had an “accident” last year as we were putting it on the tree. Mikey actually grabbed it too tightly and put a hole in it!! 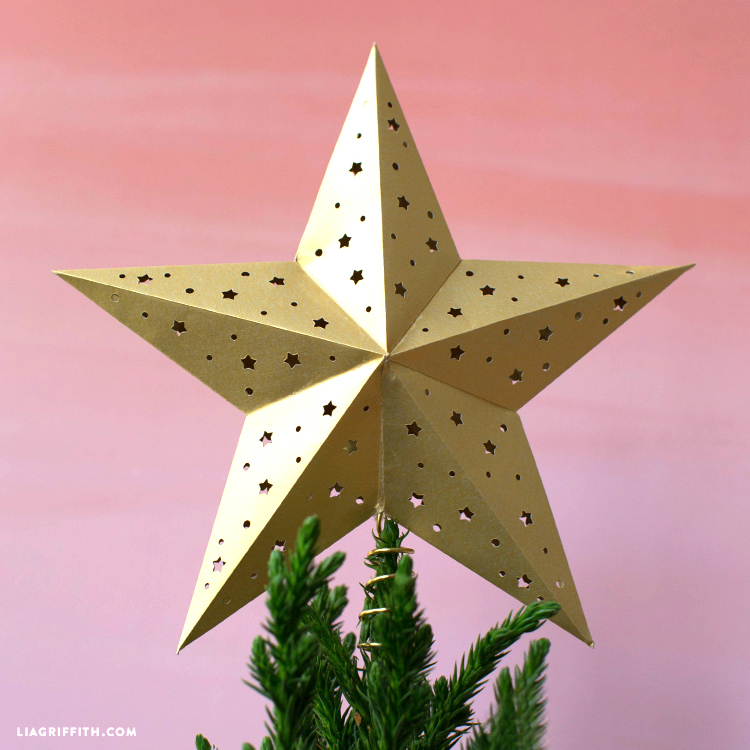 I’ve been thinking that I would like to make a pretty star with my Cricut Maker and voila! Here it is. I can’t wait to get to work on it after Thanksgiving. The day after Thanksgiving has traditionally been the day that the boxes come out of the garage and the holiday decorating begins. Your timing couldn’t be better. Happy Thanksgiving to you, your family, and your wonderful team that keeps those hits coming one after another! Yay Susan! I’m so glad our timing was right 🙂 Happy Thanksgiving to you and your loved ones!